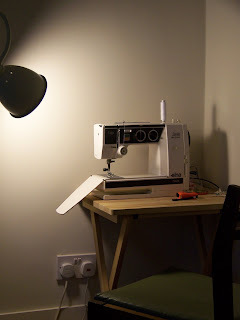 That is a new sewing machine within her budget to replace her well loved and slowly fading machine. Poor Elna how well she has served both me, and my MIL before me, but she is on her last legs. It pains me to hear her chugging away and no amount of oiling and cleaning will stop the progress of her deterioration. The light connections have gone too, hence the lamp in the photo, I got a quote to get her fixed up a bit but it was more than buying a new one. I have been looking for a while to replace my machine but have yet to find the perfect one which feel as good to sew on as this one does. Well I have but really I need to find one under £700. So the search is still on, any suggestions are very gratefully received. PS I want to spend under £200 ideally and it only need to be a simple but hardwearing machine. Finding a new machine can be difficult. I went for a Janome, quite basic no super embroidery stitches and a 1 stage button hole. It is great, relilable and easy to use. thanks for the advice, still haven't made a decision yet.